Dr. Paul Babyn is the Department Head of Medical Imaging for the Saskatchewan Health Authority and the University of Saskatchewan. He spoke with the Royal University Hospital Foundation about the Picture This! Campaign, which raised funds for a PET-CT (Positron Emission Tomography-Computer Tomography) in Royal University Hospital. Why is a PET-CT so important to patients and their families at Royal University Hospital, as well as to the Saskatoon Health Region and the province? Having a PET-CT allows us to provide the most advanced medical imaging care available in the country to cancer, cardiac and neurology patients, potentially allowing physicians to avoid additional invasive examinations or surgical procedures. Patients can get earlier diagnoses and faster treatments right here at RUH. How important is PET-CT to attracting talent in the field of nuclear medicine? Having a PET-CT scanner makes RUH an attractive and preferred location for highly skilled physicians, as well as nuclear medicine radiologists and other staff. In some cases, it is the very reason nuclear medicine physicians have chosen to come and practise here, which means we will always be on the cutting edge of research advancements. That’s critical to clinical care. 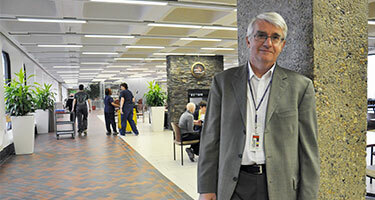 How does PET-CT fit with the larger vision for the university, hospital and province? It recognizes and builds on the legacy of the late Dr. Sylvia Fedoruk. She was a medical physicist and the sole female member of the team that first successfully treated a cancer patient with Cobalt-60 radiation therapy at the U of S in 1951. The Sylvia Fedoruk Canadian Centre for Nuclear Innovation was named in her honour. It and the Saskatchewan Centre for Cyclotron Sciences are part of a larger vision for Saskatchewan to provide excellence in nuclear medicine, research and training. Dr. Sylvia Fedoruk certainly was a pioneer. How does PET-CT fit with her legacy? The device and techniques Fedoruk helped develop are still used to this day to treat cancer. Daily, more than 45,000 radiation treatments are delivered in more than 80 countries. According to the Canadian Medical Hall of Fame, her ground-breaking research in cobalt radiation has helped more than 70 million people worldwide. Our goal at RUH is to provide PET-CT services to help thousands of patients right here in Saskatchewan. Thanks to generous donors, the RUH installed Saskatchewan’s first PET-CT in April 2013, and has since allowed patients to remain in Saskatchewan to be scanned. The Saskatchewan Centre for Cyclotron Sciences produced its first radioisotopes on June 24, 2015. The cyclotron will produce radioisotopes for medical PET-CT scans. Your Community. Your Health. Help us make a difference. Sign up and find out how your donations are making a difference.